In this Nov. 19, 2017, file photo, Demi Lovato attends the 2017 American Music Awards at Microsoft Theater in Los Angeles, California. Upon leaving Cedars-Sinai hospital last week, Demi Lovato immediately entered rehab for addiction treatment and now, a source tells E! News, "She will be in rehab for several months and is doing an extensive program to ensure she gets the help she needs." The 25-year-old is currently in Chicago, where she is undergoing treatment with a therapist who focuses on sobriety, mental health and wellness. This trip to visit the specialist in Chicago is just one of the many steps the former Disney star is taking to maintain her sobriety, following an apparent overdose on July 24. 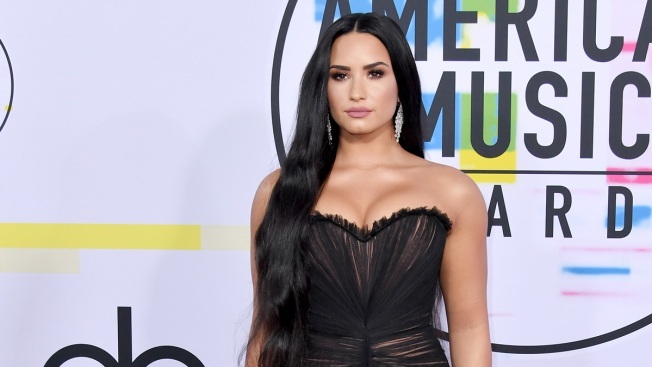 With the singer placing the utmost importance on overcoming her addiction, she decided to cancel the remaining tour dates in her "Tell Me You Love Me" tour and has kept social contact to a minimum. The insider reports that Lovato "hasn't been in communication with anyone and is really focusing on herself." That also includes limiting contact with her ex-boyfriend, Wilmer Valderrama, who visited the singer at the hospital as she recovered from extreme nausea and high fever. "Wilmer has been in touch with the family and has been checking in on Demi's status," but has been unable to speak to her as she undergoes treatment. The source explained, "The family is trying to make sure they eliminate all distractions and want her to be focusing on her health right now." Overall, "Demi is doing much better," both mentally and physically. "She has become more open and is happy she is getting the help she needs," especially after she began to "grasp the severity of what happened and that she almost died." While her health was what ultimately led the singer to enter rehab, a source previously told E! News, "She wants to make a statement to her fans, family and friends that she is strong and can recover." After her discharge from the hospital, the singer broke her silence with a post to Instagram. "I have always been transparent about my journey with addiction. What I've learned is that this illness is not something that disappears or fades with time. It is something I must continue to overcome and have not done yet," she wrote. Lovato thanked her family, team, the staff at the hospital and her fans for their love and support. "The love you have all shown me will never be forgotten and I look forward to the day where I can say I came out on the other side," she finished her message. As she continues on her path to sobriety, the source says, "Demi hopes to make a full recovery and be able to do the one thing she loves: Music."